See every detail in 2-Megapixel HD resolution so you can finally decipher face from fiction. Configure your home security system with an easy plug and play setup. Avoid the hassle of multiple cables by transmitting video and audio over a single BNC cable with this pentabrid DVR. 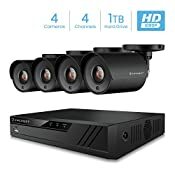 Includes four security cameras that will define your security system. 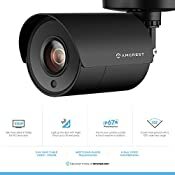 Experience a super-wide 103° viewing angle, motion detection, and night vision up to 98ft. This camera is equipped with an IP67 weatherproof housing so it can endure the elements. 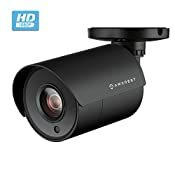 Receive text and email notifications as soon as your outdoor camera detects motion. 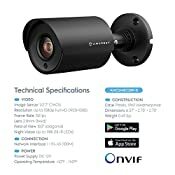 Always stay in the know - even when you're on the go - by viewing your surveillance camera's footage on your smartphone or computer. At Amcrest, we want to ensure the safety of our customers, their loved ones, homes, and businesses. You'll receive a full 1-year US Warranty and Lifetime Support provided directly from Amcrest.